1) (Carlisle, co. Cumberland; descended from Sir Richard Mulcaster, Knt., Lord of Taperham, temp. William II.). (Charlwood, co. Surrey, Visit. 1662, descended from George Mulcaster, a younger son of William Mulcaster, Esq., of Carlisle. Major-Gen. Frederick George Mulcaster, Col. Royal Engineers, a descendant of this line, d. 1797, leaving three sons: Gen. Frederick William Mulcaster, of Charlton Place, near Canterbury; Sir William Howe Mulcaster, C.B., Captain R.N. 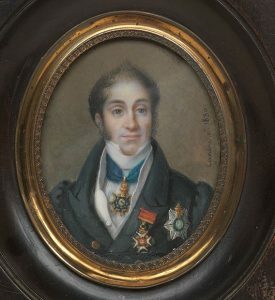 ; and Captain Edmond Robert Mulcaster, slain at Badajoz). Ar. four bars gu. over all a bend az. Crest—A lion ramp. az. ducally gorged or, holding a sword erect ar. pommel and hilt of the second, the point embrued gu. 2) (Barham, co. Kent). Barry of ten or and sa. a bend erminois, a canton gu. Crest—A lion ramp. erminois, in the dexter forcpaw a sword erect, the dexter hind foot resting upon a bomb fired ppr. This is a local name meaning “of Mulcaster”, later corrupted as Muncaster, which is a parish in county Cumberland. It is claimed that all members of this family descend from one David de Mulcaster, the son of Benedict Pennington (1130-1186 AD), the son of Gamel de Pennington. The Pennington family possessed land in Mulcaster since early times, and some people from the area bore the surname De Mulcaster. Alan de Penitone was granted Muncaster estate in 1208 AD. Richard de Mulcaster as warder (protector) of Carlisle Castle during the era of William Rufus (King William II of England from 1087-1100 AD). One source refers to the name as Scandinavian and Anglo-Latin. The Roman word Meolcastre means the camp at the sand bank or sand hill. The Old Norse word melr means a sand bank or sand hill, and the Latin word castra means a camp or fort. Muncaster Castle overlooks the Esk river and is currently owned by the Pennington family. The township was granted to John de Utterfield by Alice de Romely, and later was had the Mulcaster family. 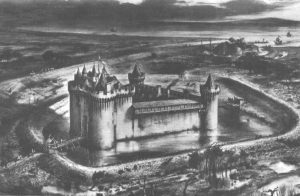 In 1400 AD, Robert de Mulcastre conveyed it to Robert de Highmore. Another author mentions that it comes from the Old Norse personal name Muli (meaning a snout) or the Olde English name Mulda (meaning a mule). The family fought on the side of King Edward during the War of The Roses. Common spelling variations of this last name include: Muncaster, Molcaster, and Moncaster. The first recorded person in history with this surname was Richard Mulcaster in 1093 AD. The next earliest recorded bearer was Wlater de Mulecastr who was documented in the Assize Court Rolls of Yorkshire in 1219 AD. Robert de Molecastre and Walter Mulecastre were recorded in county Cumbria in 1279 and 1287, AD, respectively, in the Writs of Parliament. Early marriages involving this surname include Rycharde Monckestre to Katherine Ashleye at St. Michael in Cornhill, Mulcaster to Henry Hesketh in 1662 in Canterbury, and Jenat Muncaster to James Hall in 1577 in Whicham. William Mulcaster, born in 1714, married Jane (surname unknown), and with her had a son named Frederick George, who was born in 1739 at St. James in Westminister. He married Mary Auchmuty and later Wilhemina de Braham and had the following issue: Ann Mulcaster, Frederick William, Mary Lucy, William Howe, and Edmund Robert. The son Frederick William was born in 1772 in St. Augustine, Florida. He married Mary Montresor in 1801 and with her had a child name Frances Eliza Mulcaster, before he died in 1846 in Charlton, England. The family motto is vincit amor patria, meaning “my beloved country will conquer”. Famous people with this last name include: 1) Richard Mulcaster (1531-1611) who is well-known for his pedagogic literature and the founder of English language lexicography and 2) John Mulcaster Carrick (1833-1896) who was a British painter.